Well our 'young reds' (pair of Old English game cross Indian Game hens) and 'Lucky-Lu' (AKA Lucy) our surviving Sussex from the Christmas hatch were promoted to the big girl run over the weekend. And the two pure Indian Game pullets progressed to the adult Indian Game flock. 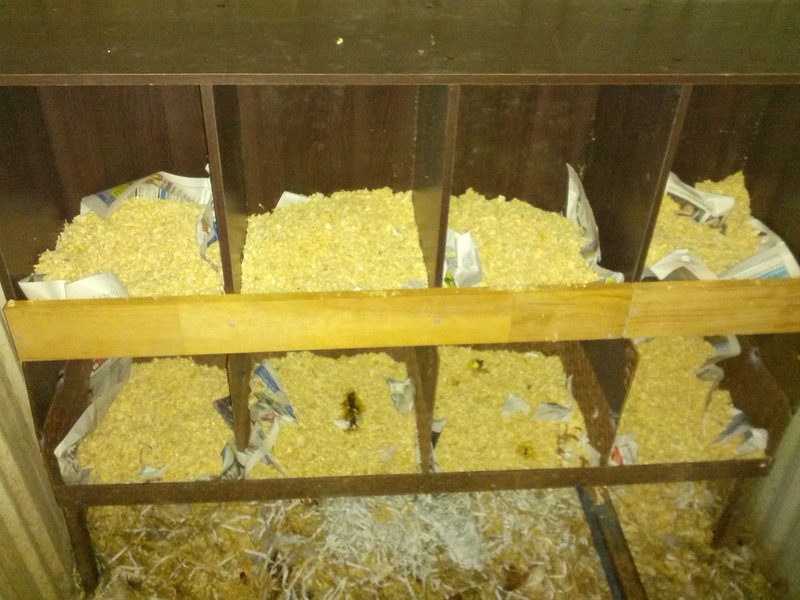 We had hoped to make some more room in the 'chick run' as it was becoming rather crowded; only we still have a number of roosters and the young poult in there. 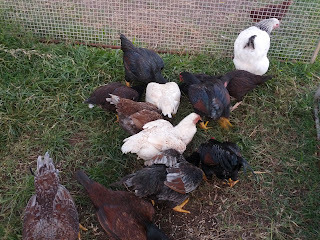 Some of the roosters and one of the Indian game girls are 14 week old now, the rest only 12 weeks. But they're fully feathered and some of the roosters have even began to crow! But the girls still look so small to be in the big run! The girls would eventually live out with their prospective flocks anyway, where as the boys will fight without existing roosters so need to be kept separate. We had tried moving Lucy out before, but she was young and chickens can be mean. .. So she was allowed to remain in the chick run til the others were older; as I figured safety in numbers. As we were introducing additional members to the flocks (even though it has been slowly depleting) we wanted to expand the number of nesting boxes. Chickens prefer a warm, dark and enclosed area to nest. And as we are hoping to relocate the small hut (a converted dog kennel), to the front we wanted to provide a snug and attractive environment in the large fowl shed and the low shelter and small fowl house out the front. 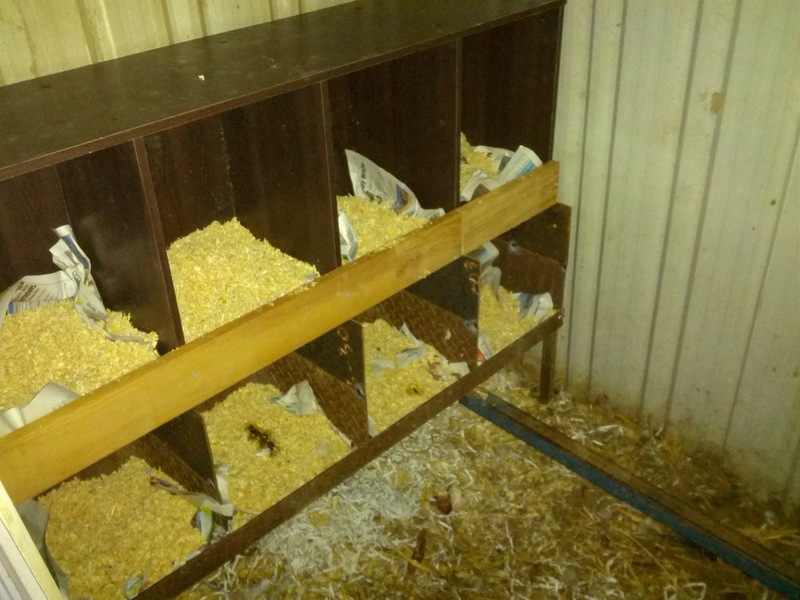 The intention is that the new girls will adopt the new nesting boxes and when their settled, we should be able to take the other hutch away. Then the older girls can adapt, rather than the new ones being bullied out. So as I posted a few weeks back we picked up a couple of cheap, second hand bookcases. 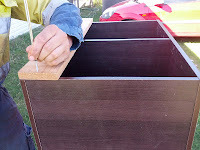 Ideal, as they were already partitioned, so all we needed to do was upgrade the existing boxes to support the new ones. 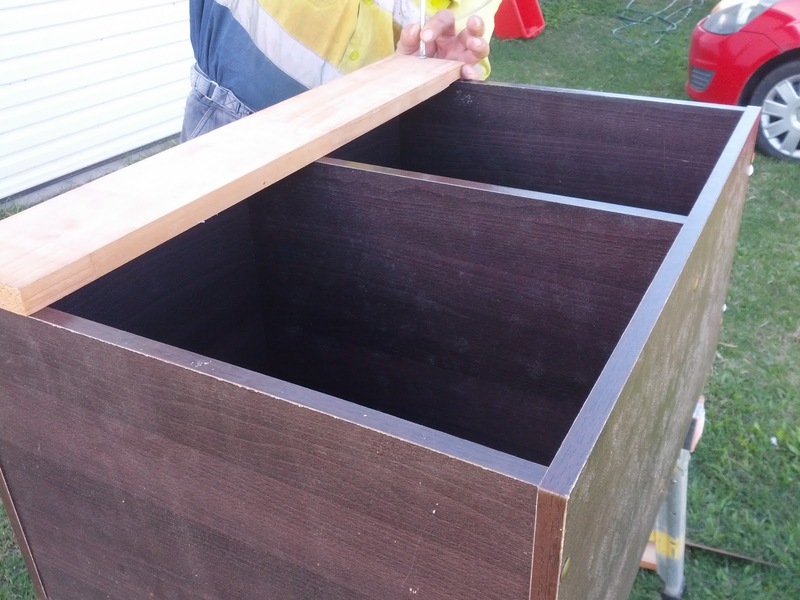 And attach a piece of timber to the front to create the nest. So our laying flock now have 12 nesting areas. These girls do share with the ducks, geese and turkeys, although only the ducks will use the nesting area if any. As the turkeys roost either on the 8 foot fencing or on the fowl house, the geese and ducks sleep outside, occasionally sheltering in the shed, but not in the nesting area. 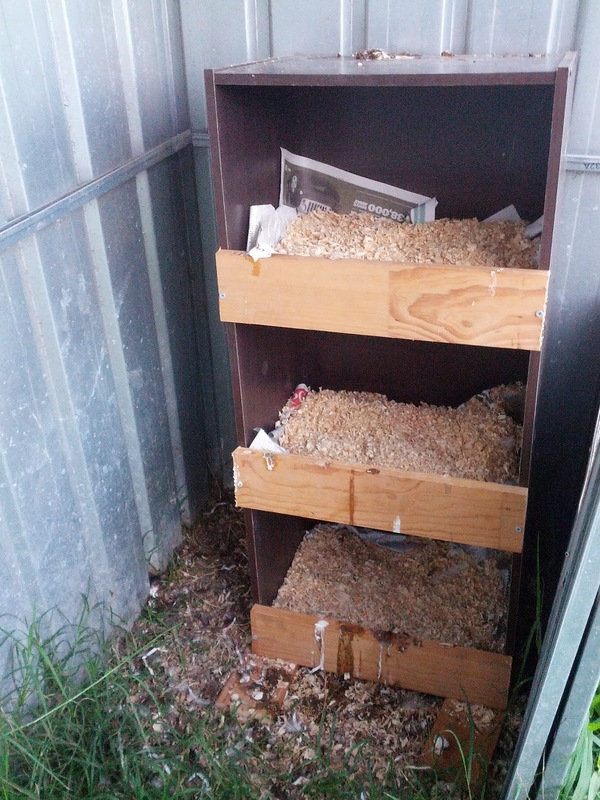 The ducks have laid in under the original boxes in the past, but they will just lay wherever they feel safe. So by adding another 4 on top, at least the ducks can claim the floor levels if they want and our girls will still have plenty of room. All 5 girls have continued to make their way back to the 'chick run' each night to roost. This is normal, chickens are creatures of habit. So at or just after dusk each evening, I collect the young pullets and put them to bed. 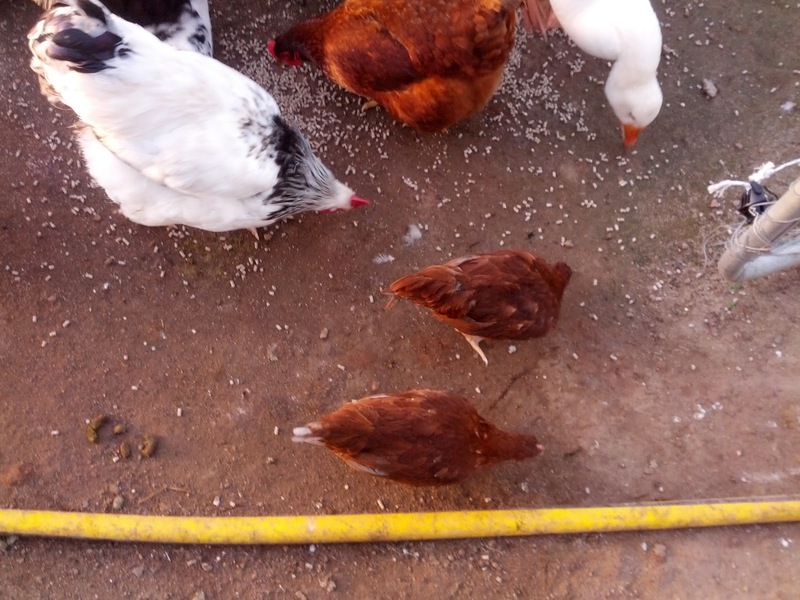 Lucy and the two young reds in the big fowl house and the 2 Indian Games in their run. I had placed them in under the low shed, but found them last night in the bottom nest in the small fowl house. I guess the main thing is, that they are safe and warm; as temperatures have been dropping below 10 degrees over night. And the night before I found them beside the shed in the long grass, although they were very warm to touch when I picked them up.